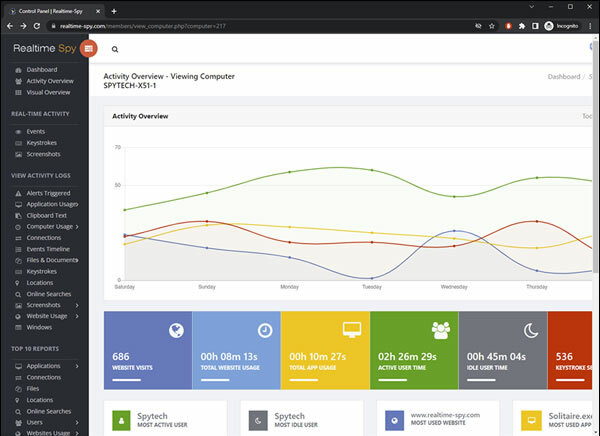 The first software of its kind... Realtime-Spy is a cloud-based computer monitoring solution that allows you to remotely install the software on any computer you own as well as view the log files from anywhere in the world via your own personal Realtime-Spy webspace! Realtime-Spy allows you to see what users do, and what users type, as they perform the actions, in real-time. Once installed, all log files are uploaded secretly to your personal Realtime-Spy account on our server. This enables you to view reports in real-time from anywhere, at any time. Purchase Realtime-Spy today and start monitoring your computer in minutes. Your download is available immediately after purchase so you can install and start using Realtime-Spy right away! Test our Online Demo Account. System Requirements Legal Requirements How Realtime-Spy Works Realtime-Spy FAQ Realtime-Spy's Awards Install Guide Monitoring Software Compare Software Why Spytech?